Utility Microgrids: What's Fair and Who Pays for Them? It’s easy to identify microgrid benefits. But figuring out the business model to monetize those benefits is another story, especially when it comes to utility microgrids. The issue is tangled in state regulation, most of it formulated well before resiliency became a societal priority and microgrids came into play. 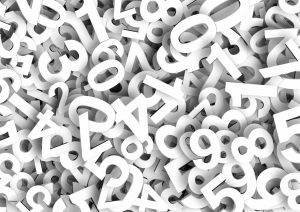 These rules can make it difficult, or even impossible, for utilities to recover costs incurred from developing microgrids. Adding to the complexity, restructured states typically bar utilities from owning microgrids or at least the generating facilities within them. Vexing as these issues are, utilities have made clear they want to be part of the microgrid revolution. To that end, they are exploring new business models that will allow them to do so. 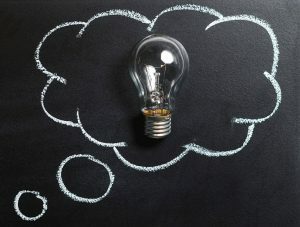 Organizing the effort is John Caldwell, the director of economics for the Edison Electric Institute (EEI), an association that represents all U.S. investor-owned electric utilities. Caldwell has brought together a team of its member utilities that are keen for answers. As more utilities propose microgrids, state regulators worry about balancing microgrid benefits and costs. They raise fairness issues. Should utilities be allowed to socialize the costs of microgrids across all ratepayers, as they do other utility infrastructure investments? Or should costs be borne by those who receive back-up power from the microgrid during a grid outage? The answer would be simple if utility microgrids served only those within their footprint. But some are designed to help the community in a crisis. Microgrids offer the public access to electrified shelters, hospitals, gas stations, grocery stores and police stations. A microgrid’s electrified buildings can serve as places to plug in phones, a cherished ability during an extended outage. How is the microgrid compensated for these services? 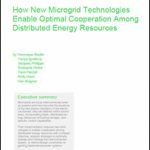 Adding to the complexity, advanced microgrids increasingly act to strengthen the broader grid during normal operations when there is no power outage. For example, microgrids may provide ancillary services and demand response. Some utility microgrids are built as non-wire alternatives — a way to relieve congestion or add capacity at constrained areas of the grid, places where electricity traffic jams can occur and put upward pressure on power prices. More could probably be used this way if it was clear how compensation would work. Such issues create a complicated financial picture for utility microgrids, especially in restructured states, where independent companies compete to supply electric customers. While utilities describe why they should play a role in microgrid development, competitors argue the other way. They worry that utilities could dominate the microgrid market if they are allowed to recover costs from all ratepayers. They have been raising these concerns in legislative and regulatory proceedings in Illinois, Maryland, New York, Pennsylvania and other states. Caldwell and the utility microgrid task force are looking at a range of innovations, meant to address the competing concerns. Arizona Public Service offers an example of a cost-sharing partnership. The utility developed a microgrid for a data center owned by Aligned Data Centers. The microgrid provides not only back-up power to the data center but also capacity and frequency response for the central grid. The utility isolated how much of the microgrid cost could be attributed to the services it provides to the grid and won approval from state regulators to recover those costs. The data center pays for the back-up generation. In New York, National Grid is exploring another approach, this one for a microgrid under development by Clarkson University in Potsdam. The utility wants to test the idea of offering services to the microgrid for compensation. The services include building underground wiring and handling billing, the kind of activities where utilities bring a high degree of expertise. The utility will make its pricing for the services available and microgrid customers can either choose the utility or hire an independent company. In Illinois, state regulators recently granted a utility cost recovery for a demonstration microgrid, in recognition that the project would provide valuable learnings. In this case, Commonwealth Edison plans to build a microgrid that will create a cluster — two microgrids acting in synchrony to achieve greater efficiencies and resiliency. EEI has been exploring these concepts through team meetings with its members, research and at microgrid conferences. In October 2017, EEI hosted a conference at its Washington, D.C. headquarters that was organized by the groups, Leaders in Energy and Resilient Virginia. Called “Improving Resiliency through Microgrids and Battery Storage,” the event included a range of speakers from the military, Department of Energy, US Green Building Council, Montgomery County, Urban Ingenuity and other organizations. Panelists will include William Muston, R&D manager, Oncor Electric Delivery, Tim Roughan, director of energy and environmental policy, National Grid and Jane Park, vice president, regulatory policy & strategy, Commonwealth Edison. The panel will focus innovative pricing structures, business partnerships, and new customer services — along with regulatory complexities. 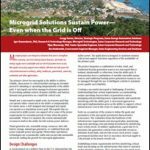 See Microgrid 2018 for full conference agenda and deadlines.